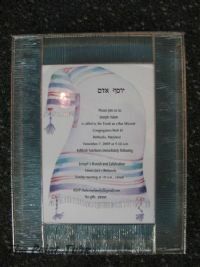 What a wonderful memory to encase a wedding,bar/bat mitzvah or a birth announcement in a stained glass box. Send us your invite which will be placed within the glass on the lid. A color coordinated glass will be matched to complete the stained glass box. keep it from bending in the mail.